A man sits on a platform at the Gare Lille Flandres railway station a few hours before a nationwide strike by French SNCF railway workers, in Lille, France, April 2, 2018. France faces a first wave of rolling railway strikes Tuesday that are expected to bring travel chaos in a test of President Emmanuel Macron's resolve to modernize the French economy. The four main rail unions have called two days of strikes in every five days for the next three months to protest a shake-up of the national SNCF rail monopoly before it is opened up to competition as required by EU law. The last time a French president squared off against rail unions over workers' benefits, it ended badly. The strikes of 1995 paralyzed Paris and forced prime minister Alain Juppe to pull the reforms, a defeat from which he failed to recover. French unions are, however, weaker than in 1995 and divided in their response to Macron's social and economic reforms. More than half of French people view the strike plan as unjustified, according to an Ifop poll published Sunday. 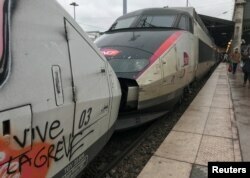 FILE - A tag on a TGV high-speed train reads "long live the strike" at the Gare du Nord railway station in Paris, France, March 23, 2018. "French people don't want to put up with three months of chaos that has no justification," Transport Minister Elizabeth Borne told weekend newspaper Le Journal du Dimanche. The SNCF expects one the biggest strikes in years, with nearly one in two staff saying in advance they would take part. Commuter lines into Paris will be hit hard and only one in eight high-speed TGVs will operate, the SNCF has said. International train services also face disruption: no trains will run between France, Switzerland, Italy and Spain. One in every three trains to Germany will operate, while the Eurostar service connecting London, Paris and Brussels will operate three out of every four trains, the SNCF said. SNCF boss Guillaume Pepy, who backs the reforms, has warned of widespread disruption. "I want to be very clear ... the strike action will no doubt be widely adhered to and is going to make the lives of a lot of people very difficult," he said in a radio interview. Macron wants to transform heavily indebted SNCF into a profit-maker. Unions say he is paving the way for privatization. If Macron triumphs over the unions, it will set the tone for other key reform plans including revamping the education system and overhauling pensions. He has already stared them down over easing labor laws. ​SNCF workers fear they could lose job-for-life guarantees, automatic annual pay rises and a generous early retirement policy. Borne has sought to ease tensions with assurances that current SNCF employees that have to move to a competitor in the future would keep most of their advantages. The Communist-rooted CGT wants the strike to spread beyond the rail sector. Energy sector workers plan to join the strike action from April 3 to June 28, to protest the planned liberalization of the power sector. The CGT has called for public and private sector workers nationwide to strike April 19, but in a sign of union division private sector unions have so far declined.